Why is it that we (that I) get so hung up on the mistakes we make? Or even sometimes on the mistakes that others make around us. What is this notion that somehow resides inside us that has convinced us that mistakes are bad? How have we learned to have no compassion for ourselves and others? Teddy Roosevelt had a great point. The only people who don’t make mistakes are those who sit on their duffs and do nothing. Simply by putting ourselves out there, by trying new things, by involving ourselves in the world… we are setting ourselves up to make mistakes. And if we don’t make mistakes, we’re probably not doing anything at all. Where has the fear of a mistake stopped you from doing something? When was the last time you allowed yourself to easily make a mistake? Please leave a comment to share. 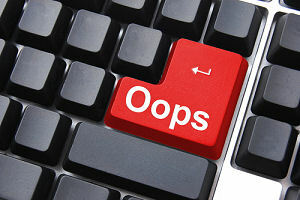 For support in making mistakes well, contact Robyn at rmcleod@chatsworthconsulting.com. I have this conversation with my staff all the time. I have to ask, “Why are you beating yourself up? Did you learn something new from that mistake?”. Often times the answer is yes. I will tell them, I learn something new everyday. Making mistakes is sometimes the best way to learn something new. It’s amazing to see how they relax once we have this conversation. So wonderful to hear from you, and no surprise you’re, as always, stepping in as a powerful, thoughtful, caring leader. Yay you that you know mistakes are a great way to learn, and double yay you that you can share that with your team – and see them relax. Thank you for staying in touch! !